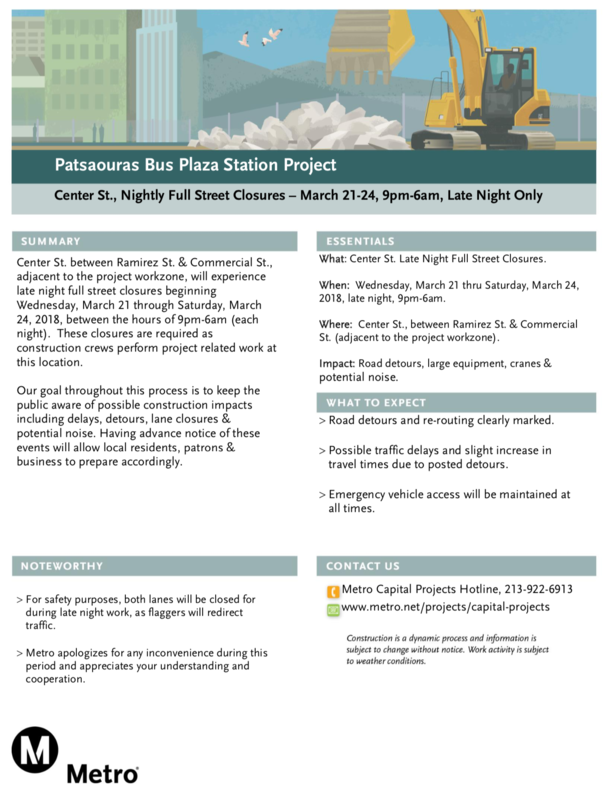 Center Street between Ramirez St. and Commercial St. will be closed from March 21 through March 24 between the hours of 9 a.m. to 6 a.m. for Patsaouras Bus Plaza Station Project construction. hey Metro when is this project expected to complete? I have been waiting so long for the new Silver Line platform in Union Station. The website shows its expected to complete in Spring 2018. The current forecast completion date is Dec. 2018. Please see this report for current project forecast dates: http://metro.legistar1.com/metro/attachments/419bf89b-d842-4c5a-9489-08d1e76a8eb6.pdf.